If you follow along on insta, then you heard the news last week but just in case you don't...it's true! We are expecting our third little babe in early July! I'm already almost 17 weeks (second trimester!) and so I've missed a lot of pregnancy progress post opportunities but, let's be honest: you're probably not all that sad about it. 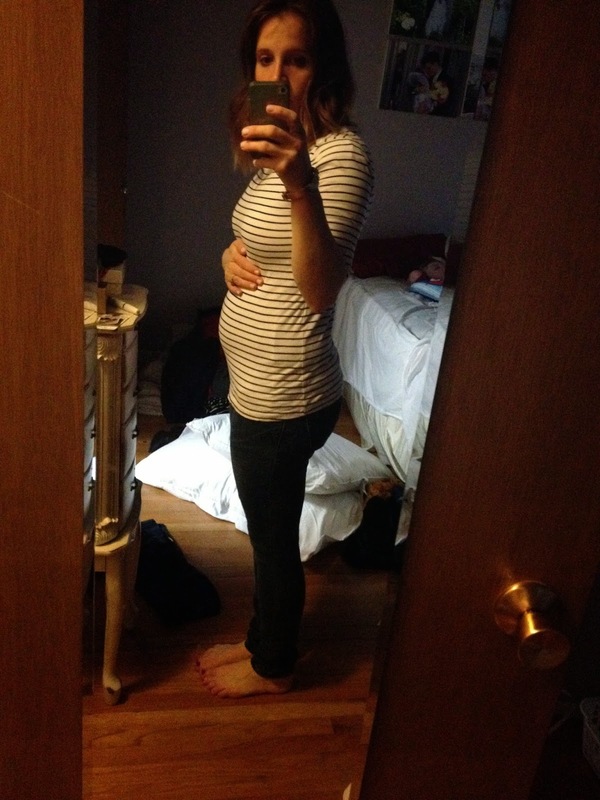 So in place of all those 17 weeks of updates how about a quick first trimester recap (with some selfie bump shots thrown in there)? + I have been totally and completely exhausted this pregnancy! I mean, seriously. First trimester exhaustion is no joke. Tom thinks I've just forgotten but I am telling you that I was not nearly this exhausted with either of my previous two pregnancies! I'm sure a lot of it has to do with the fact that I'm chasing two little boys around all day every day but really. Exhausted doesn't even begin to really touch the surface. So that is where I have really been the last several weeks (I have no excuse for my absences before that ha). I've been spending all my "spare" time either napping or walking around like a zombie. By about 14 weeks the exhaustion weaned a little bit but still I'm not getting any second trimester bursts of energy like they talk about. + No nausea yet again! Man am I lucky or what!? This is the one pregnancy symptom that I think would be the very worst to me. I have a really irrational fear of vomiting and so the fact that I've not been sick for any of my three pregnancies is such a huge, huge blessing. I do have to admit that for about 6 days I felt somewhat nauseous for a few hours of the day but if I ate something I immediately felt 100% better. And I never felt sick enough where I thought I might throw up. + Boy or girl, boy or girl?! I am just dying to know! We find out in a little less than two weeks and time could not be passing any slower! With both Jack & Phillip I had a suspicion they were boys. But with this one!? I just don't even have a guess! I think if I was forced to guess I would say I'm leaning more toward thinking it's a boy but maybe that's just because I'm used to boys? I have been very back and forth on if I want it to be a boy or a girl. One day I really hope it's a girl and then the next day I walk into a store and see the little newborn boy clothes and think "just give me all the boys!" + I feel like a whale. I swear that my belly popped out WAY sooner than it did with Jack or Phillip. I know they say you show earlier with each pregnancy but actually I was able to hide my pregnancy with Phillip for way longer than I was able to with Jack! Pretty sure it has to do with the fact that I had some abs before I had Phillip and had no abs to speak of before Jack or this baby ha. I think the picture below is at 15 weeks. + I la-la-la-LOVE my doctor. If you are in the Sacramento area and ever looking for an OB please email me because I will refer you immediately. I loved my doctor in Utah (who delivered Jack), did not care for my first doctor with Phillip and switched at 28 weeks to a new doctor...loved him but it turned out that neither he nor nobody from his office even delivered me and that was not a great experience. having to pee all. the. time. I actually suspected I might be pregnant a few days before my missed period because I was suddenly waking up early in the morning needing to pee which is so weird for me. With my last two pregnancies I would say needing to pee all the time didn't start until week 6-8 but this time it came on BAM before 4 weeks and was SO BAD the whole first trimester. Like waking up four times a night! That's third trimester business! I never had it that bad with Jack or Phillip. round ligament pain. again, started 100x earlier than with Phillip (never had it with Jack). pelvic/hip paint. for like 2-3 weeks I felt like my hip was dislocated. seriously. luckily, it went away and i'm keeping my fingers crossed it does not come back! sciatic nerve pain. had this with phillip starting sometime in the third trimester and it lasted the duration of the pregnancy. at times it was so bad that i literally was crawling around the house because i could. not. walk. could not. this time my first episode hit at 15 weeks. 15 weeks! Luckily, it lasts for hours instead of days like it did with Phillip and episodes are rare. ...faint as it was (I was only one day late and I was testing at night instead of the recommended first morning urine) it was definitely POSITIVE. I would say that "announcing" the pregnancy to him this way was WAY better than my first two attempts. He was definitely excited and I was actually the one a little shocked! HA practice makes perfect I guess? I told him from now on he is going to be the one to check all my tests haha! Oh, and to answer our most frequently asked question: When "new baby" (as we refer to him/her around here since we frequently call Phillip baby and Jack gets very confused haha!) arrives (assuming he/she arrives on time! ), Jack will be three weeks shy of 3 and Phillip will be 17.5 months. And yes, they were all planned. Congratulations to you both!!! That is very exciting! And your kids are so lucky to be close in age, my sister is 8 years older than me, and we both wished that we had a sibling in between us to bridge the gap haha. Thanks, Kate! We love having them so close! I'm sure it will get a little crazy at times with three little ones but I think that they'll love it! Congratulations, Marci! I absolutely HATE the waiting game of finding out what he/she is!! And having the husband find out first sounds like fun, so I'm going to try that next time! Thanks for the idea! Your blog is so so cute, glad I found it!